Introduction: Significant obesity is an increasing co-morbidity in pulmonary hypertension (PH). We note many patients with echo features of pre-capillary PH (PrePH) who were being classified as post-capillary PH (PostPH), due to elevated pulmonary wedge pressure (PWP). We wished to assess the impact of intrathoracic pressure (ITP) measurements on haemodynamics during artificial alterations of ITP in obese patients and on classification. Methods: Obese individuals underwent invasive cardiac cath and intra-oesophageal pressure (IOP) measurements. Haemodynamics were measured during end-expiration, Valsalva and external compression of the abdomen. Fluid challenge was administered in selected patients. Results: 17 patients underwent investigation between Jan ‘13 and Dec ’16. There was a direct 1:1 linear relationship between ITP, as assessed by IOP, and wedge pressure (PWP) (Fig 1A). 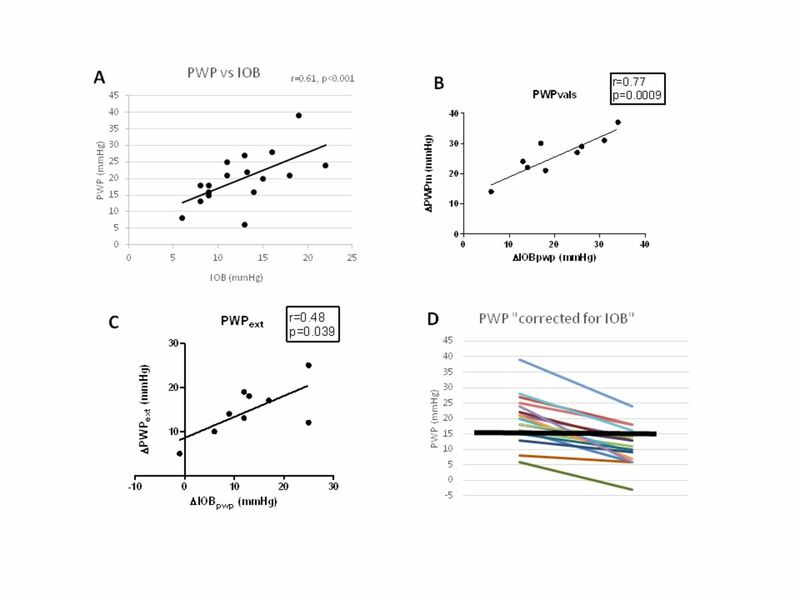 There was a tight relationship between IOB and PWP during manoeuvres (Valsalva, 1B; external compression, 1C). Following fluid, PWP rose by 4 mmHg. 14/17 patients were classified as PostPH, but following correction for expected ITP (4mmHg), only 3/17 were classified as PostPH (1D). Conclusions: ITP has a 1:1 relationship on PWP. We show that this may frequently result in misclassification of patients as PostPH who have echo features of PrePH and whose PWP does not change significant with fluid challenge. Cite this article as: European Respiratory Journal 2018 52: Suppl. 62, PA3321. This is an ERS International Congress abstract. No full-text version is available. Further material to accompany this abstract may be available at www.ers-education.org (ERS member access only).